This is lamb and mint sauce, Italian style. Marinate the lamb in the fridge in its balsamic bath for at least 24 hours or, better still, 48 hours, so the flavours have time to seep into the meat. Opening it up into a butterfly makes it simple to barbecue. 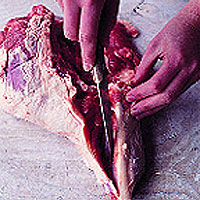 To prepare the lamb: To remove the bone, cut off the strings and open the lamb out flat, cut-sides up. Use your fingers to feel out where the remaining shank bone lies, then make a cut along its length, right through to the bone. Using short strokes, cut the meat away from the bone, working around it carefully, until you can lift it out. In the same way, remove the small knob of bone that lies below it. Trim off any large lumps of fat. One side of the fully boned lamb is likely to be much thicker than the other. To even it out make a cut in the cheek so you can open it out flat like a magazine (you'll have thicker and slightly thinner bits, but it should not be too exaggerated). Make a few deep slashes across the thickest parts, so they cook evenly. To marinate the lamb: Bruise the rosemary to release its flavour - use the end of a rolling pin or a meat mallet - then mix them with the other ingredients. Spoon a third of the marinade into a large, shallow dish and lay the meat on top. Pour over the remaining marinade. Cover with clingfilm, place in the fridge and leave for at least 24 hours. Turn the meat over occasionally and baste it with the marinade. Do not discard. To cook the lamb: Light the barbecue and leave it until the charcoal is white-hot. Arrange the grill rack close to the charcoal. .
Barbecue the lamb for 5-7 minutes on each side, to give a deep brown crust. Move the rack to about 10cm above the heat and give the lamb a further 8-13 minutes on each side, depending on your taste. When you turn the meat, baste it with the marinade to keep it moist. To check if the lamb is cooked: Press the fattest part gently but firmly with your finger. If the meat feels slightly springy, it is about medium rare. If it feels firm, it is well done. If you're not sure, go for the fail-safe test - cut it open and look. The inside should be slightly pinker than you like it, as the lamb will continue cooking a little while it is resting. To serve the lamb: Transfer to a serving dish or chopping board, cover with foil and leave to rest in a warm place (beside the barbecue or in a low oven) for 15 minutes. Carve into thick slices, and serve with the salsa verde.